There was a time I worked for a small environmental nonprofit. Instead of concentrating on environmental education, for which they were funded, they would periodically get on a rant about billboards. (The logic to that escapes me.) When I first moved to Philadelphia, billboards helped me find restaurants, bars, and frequently the right exit. I always like to know at which exits I could expect find a Dunkin Donuts, for example. 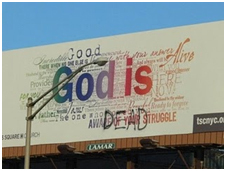 However, I must withhold my enthusiasm for outdoor advertising when it comes to religion. Consider the New Jersey turnpike. A friend of mine was once pulled over and ticketed for driving the speed limit because she was impeding the flow of traffic, i.e. going too slow. I am convinced that if you get in the way, those trucks will very willingly run you down. So why does anyone think billboards along the New Jersey turnpike are an effective means of communication? 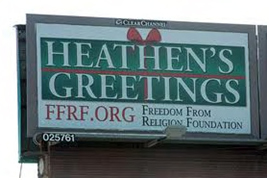 Last December some ambitious atheists decided billboards are a great place to attack Christmas. Really? Attacking Christmas is quite like hating puppies. I applaud the American Atheists for being “reasonable since 1963” but I’m thinking that was not the most reasonable campaign. Naturally, there was a response. Granted, that’s sort of old news, but while on the New Jersey turnpike this week I noticed several boards. First I saw “The Bible” board, which said something like, “Infallible. The Truth.” (It’s hard to capture perfectly while driving to avoid being run down by truckers.) Shortly after that I saw one with a 1-800 number over an American flag that said “Why Islam?” Congratulations to American Muslims for jumping in the fray, but no one has time to write down a 1-800 number while driving on the NJ Turnpike. We’re all just driving to stay alive. Here is an attempt at something more artsy that was edited with graffiti. Now that’s public discourse! 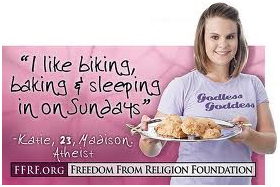 Here are two of my favorites from the “Freedom From Religion Foundation” Web site. I want a billboard that just says, “Why?” That’s it. Nothing else. You know everyone would be claiming credit – both the atheists and the religious folk. So this summer while you’re traveling, instead of playing “I Spy,” how about playing “What would you ask God?” or any of the questions in the Joan Osborne song. Enjoy your summer. And don’t forget the Dunkin Donuts. Eating Boston Kreme can be a religious experience. –J.B.